Originally I planned to restart my blog (see here for details) with a review of the anime classic Akira (Update: which I have finally done, see review here) but after watching Satoshi Kon’s Tokyo Godfathers I had to change my plans because the experience is simply too charming and funny while wearing a heart of gold to be ignored or pushed back. 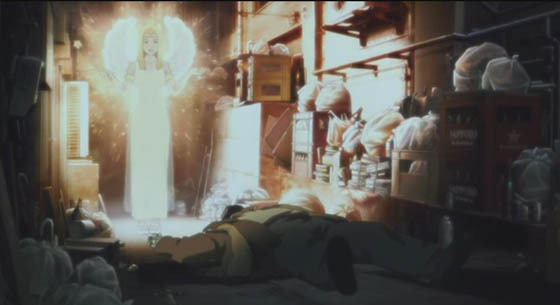 Tokyo Godfathers basically tells the story of three homeless people who one day find a baby in the trash and instead of going to the police decide to find its mother. Of course, this goal is not that easy to achieve which leads to a 90 minutes long short movie in which there are so many things happening that your head starts spinning. Not only do we get the hunt for the mother, there’s a shooting, a kidnapping, a near death experience, a mix-up, a car chase and more. 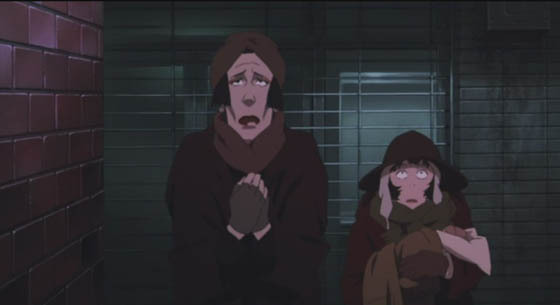 In a way you could say that Tokyo Godfathers had more plot going on in its 90 minutes than Avatar in its three hours. 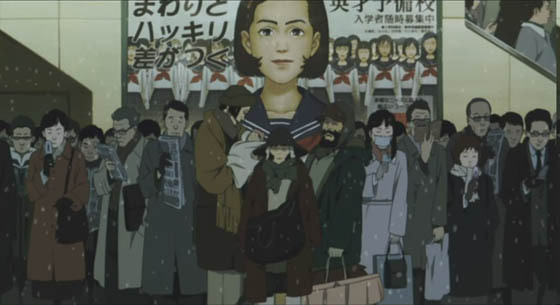 Besides all those elements, one thing is sure: after watching Tokyo Godfathers and thinking about it I knew that the director Satoshi Kon really got guts when making this movie. You know, the Japanese society seems to have the habit of ignoring the problems it faces or already has. One of those problems is the broadening poverty and therefore the existence of homeless people. There is the saying in Japan that if a nail sticks out you hammer it down. Well, they really don’t know what to do if one nail is sitting too low. In light of that kudos to the whole team for reminding the Japanese of this very serious problems. But thanks God they don’t forget the characters. And what a lovely bunch of characters they are. I simply love them and would hug greet them right away. There is the tomboyish girl who by Japanese standards behaves so not Japanese and therefore is extremely funny to watch. Then you have the transvestite who is simply made of pure win with his over-the-top but still lovable antics and his heart of gold. And last but not least the deadbeat dad who is somehow the most normal one of those three. In a way you could call them the modern version of the three Stooges because their interactions are so fantastically written and executed. By the way: The background story of each one of them shows that there is no massive naivety at work here because everyone really, really messed up their lives on their own accord. And they know it. The plot makes great use of this fact because, as the story unfolds, we see the smaller and bigger changes in them as the adventure unfolds. This fact, that everyone gets their story finished, might be one of the biggest problems of Tokyo Godfathers because the plot basically is one giant coincide. Each and almost every time they – by chance of course – meet their past in one way or another, or the people which are important for the main plot of this movie. If you want you could make a drinking game out of this and be sure to be drunk beyond heavens when the movie is over. But you know what? I didn’t care about the massive coincides because I loved the characters, the atmosphere, the art direction, the pacing and so on. In fact, I am crazy enough to state that I even like some those coincides as they help to resolve all major questions. There is even a small joke with a lottery ticket by the end of the movie to top every other coincidence so I guess the director knew very well what he was doing. 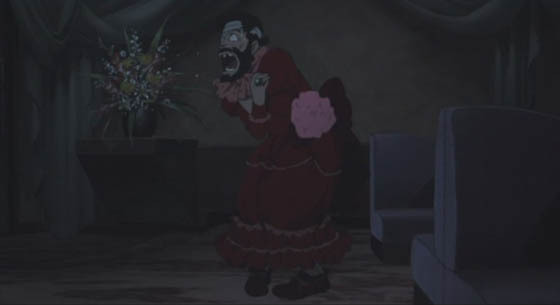 So even if by now you aren’t convinced to watch Tokyo Godfathers I present you another reason why you should: the humor. Some idiotic reviewers might call it a drama, but after only some mere minutes into the movie I knew right away it was a lighthearted – no warmhearted – comedy with some serious tones here and there. Anyone else is simply an idiot stupid not getting the point. And boy, what a comedy they managed to create. Holy crap! It’s been months since I laughed that hard during a movie. 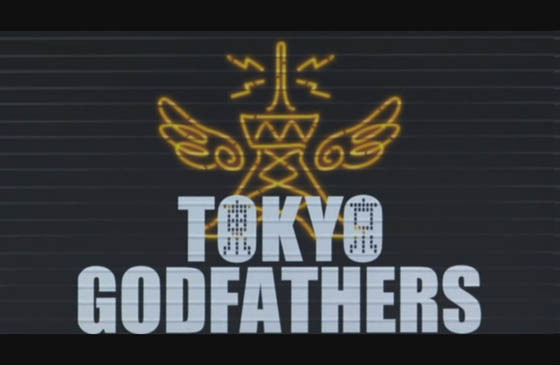 Toyko Godfathers in its best moments is classic screwball comedy accompanied by pitch perfect timing. There are way too many moments, one-liners and jokes to count so I won’t do it here because it would spoil all the fun. For those who already seen the movie: smelly train and opening eyes. 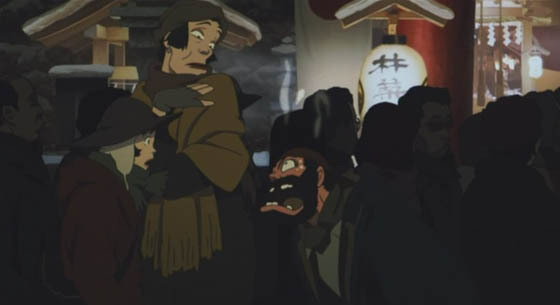 Tokyo Godfathers solidifies my impression that Japanese anime directors simply “get” comedy whereas the Hollywood directors don’t. Or can’t. In any case – if any screenwriter or director reads this – rent it, buy it, but watch it immediately and learn! The same applies to you, my beloved readers: even if you only have an ounce of interest in animation or a bunch of lovable characters you need to give Tokyo Godfathers a chance – believe me, every minutes is worth it. Some of the screenshots above should have helped you to decide. 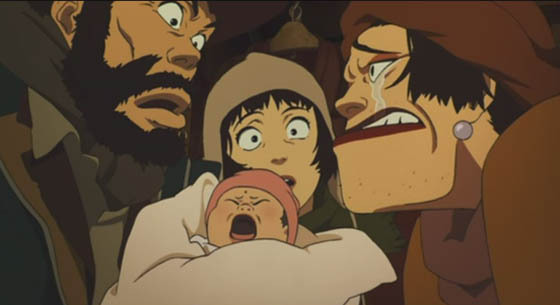 Tokyo Godfathers is a fantastically funny, heartwarming Christmas movie that yet never gets too naïve for its own sake. I really loved every minute of this movie, even the “great-!!-another-coincidence”-minutes. I have some classic Christmas movies I watch each and every year during Christmas. One is Wonderful Life, the next are Christmas Vacation, Scrooged and Christmas Carol. Consider Tokyo Godfathers added to this list of mine. It’s a worthy addition. Funny and heartwarming. This is the perfect Christmas movie.